While pellet snacks are conventionally made with potato or cereal-based flours, atypical blends can mix pulses with fortified vegetable powders to enhance a nutrition facts panel. This type of snack caught the attention of consumers in Europe and the Middle East before making an impact in the U.S. While base ingredients affect a product’s expansion characteristics, the proper machinery is critical to success. AC Horn Manufacturing has created a puffer that is a variant of the original Manley popcorn popper. The principles of manufacturing use high heat and a short dwell time to puff a preprocessed pellet. Raw pellets are manufactured on an extruder with a combination of moisture, temperature and pressure. Grains, flours and powders are the typical ingredients. Historically these pellets were fried, however a process similar to popcorn processing led to the use of hot air instead. 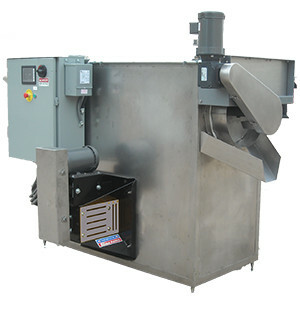 Using an extruder to combine moisture, temperature and pressure, the pellet is puffed with air instead of oil. This leads to a product with a longer shelf life because you eliminate the possibility of oil rancidity. Pellets can be transformed into limitless sizes and shapes, but the equipment design must be flexible enough to handle this wide range of shapes and formulas. Horn equipment is built with these variables in mind and includes a control panel to help manage the multiple variables. Our puffer will produce a wide array of pelletized products. However, it generally does require fine-tuning at the manufacturing facility to achieve maximum efficiency for any given product. The increased demand for healthier snacks in some markets has led to an increase in inquiries for puffers. Uniquely, some of the puffers sold by Horn act as dual-purpose machines. Though sold as a puffer, the machine can also switch to process air-popped popcorn with minimal changeover time. AC Horn Manufacturing has been a leader in high capacity, continuous popcorn production systems. We believe there is no higher quality popping system manufactured or designed on the market today. Our puffer offers the latest PLC controls and the highest quality components available. Our system provides a high capacity continuous puffer that is automatically operated from one convenient processing center. The puffer is equipped with variable speed controls of drum and fan speed as well as a more robust drum to prevent product trapping. These additional features are important to puffing operations so that airflow is maximized to the product in the appropriate amount of time. Thus, a wide variety of pellet shapes and sizes can be processed on our equipment. With a forced air combustion system, internal laminar baffling, precise burner controls and extra insulation, the Puffer provides all the features for a machine with low operating and maintenance cost. Regardless of the type of product you are puffing, we confidently guarantee superior capacities and efficiencies.